Haven’t you ever heard of a talented, handsome, rich Italian jockey yet? Playtech is glad to introduce you the heartbreaker, who is the master of his job. No one can be compared with the man when he is on the 5 reel ground taking the lead to the first position of the no download races. Hey, choose your lucky number and in case it’s the same as in Frankie Dettori’s Magic Seven Slot Machine, each gem will be yours. You have 25 lines to show the others who is the champion here, moreover, the sportsman will do his best to award you the Progressive Jackpot and the rest of his winnings. Make the magic come true. Once you see Frankie Dettori’s Magic Seven Logo approaching to you, grab at least 3 or them and don’t think about the location. The existence of these signs allows you to pick a horse to pull for. 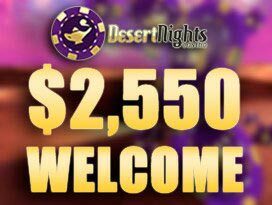 Cross your fingers, once it comes first, you will obtain 35 Free Spins. 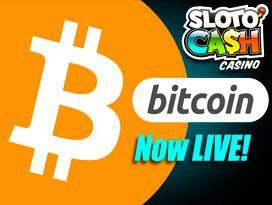 For second place, you have a chance to strike 15 Free Spins, and the third position activates 10 Free Spins. Cheer up! Watch the 1st and 5th reels to see the Racetrack icons there. That’s how you enter Magic Seven Bonus Game and start teasing your luck! Pick an area on the grass and removing the green, you reveal the prize to get. 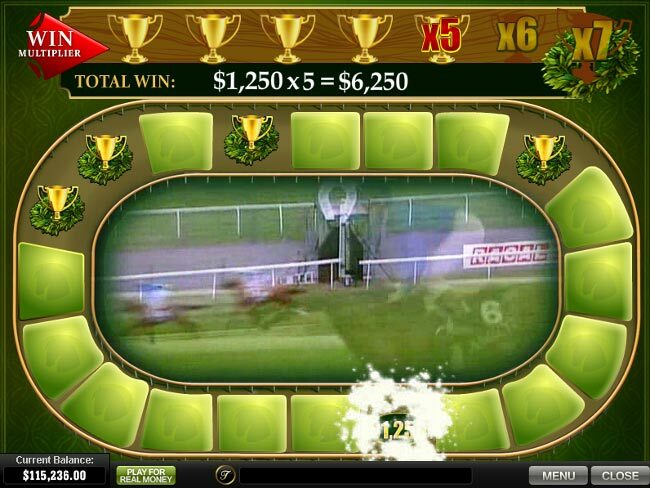 Each Trophy brings you 1+ booster, the cash prizes make you rich while ‘Collect’ button ends up the feature. Is it still not enough for you? Huh, the hero has something more for such cases. 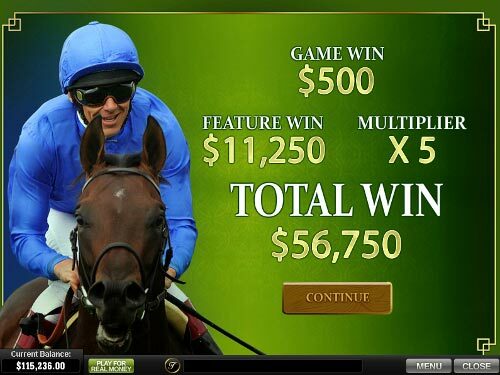 Hit a winning combination and use Gamble Feature to increase the amount. Pick whether you are eager to Double, Double Half or Collect your win and guess the card higher than shown. Be careful, once you lose, there is no way back. Being the best one in everything, Frankie Dettorie couldn’t transfer the duties of the wild symbol to anybody else. Yeah, he’s the man to replace the others and activate the highest gain. Well, maybe the heroes of other high limit slot machines will debate about his power, let us check. Anyway, no matter how strongly you believe in magic numbers or luck, the scatter symbol will show you that only fortune knows the truth. 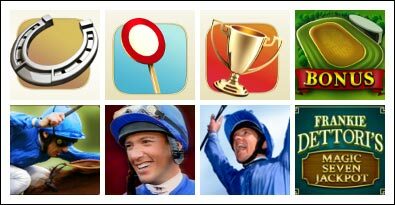 Collect as many Frankie Dettori’s Magic Seven Logos as you can and feel the richness. Up to 5 scatters will active nothing else but 1x, 5x, 25x and 250x Multiplier. No sweat. Move forward and never look back, this is how you can hit the top jackpot. Well, start with picking a coin size and don’t even think about $0.01 when there is a $5 one. Besides, placing 10 coins a line you assure your winning chances. So, only when your bet reaches $1,250, you can relax and wait for $388,850 to come and make you rich. The question remains the same. How can you activate the Progressive Jackpot? Let us say it depends on your mood, luck, day, whatever. Yeah, the highest your bet is, the more opportunities you have to strike the prize, then you will have 12 squares to choose from. Match 7 golden rewards and own Golden 7 Jackpot, or catch 5 silver trophies and receive Silver 5 Jackpot. Who cares how fast your horse runs, you will reach the goal in any case. 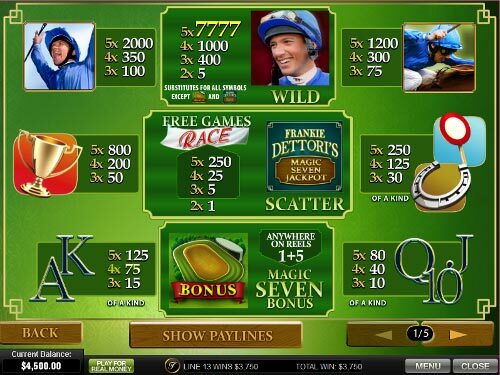 With Frankie Dettori’s Magic Seven Jackpot Slot Machine, the day is bound to change into real splashes of cash and gold. Don’t miss the chance, you can become the winner now.